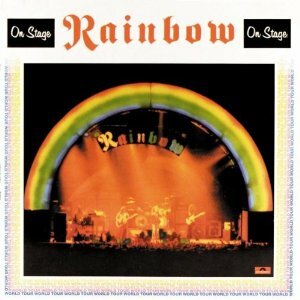 On Stage is the first live album by Ritchie Blackmore’s Rainbow featuring Ronnie James Dio’s singing and Cozy Powell on drums recorded in December 1976 in Germany & Japan. For me, the Rainbow of Rainbow Rising is the classic line up and are a worthy follow on band to Deep Purple. This is a strange set list for a live album recorded on the Rainbow Rising tour. It is their best studio album but it’s virtually ignored except for a snippet of Starstruck included in the Man On A Silver Mountain medley. At 64 minutes long, it’s also very short for a live double LP. The set order is changed and Still I’m Sad is replaced by Do You Close Your Eyes. I’m a fan of Rainbow and their first two albums but this has always been a disappointment to me. Here is Kill The King played live in concert in 1977. There have been a number of live albums that have come out of the archives for Rainbow in the 1976/1977 period. All have limitations in their set lists which stop Rainbow having a live album to challenge Made In Japan as Ritchie Blackmore’s crowning glory. This album is getting a lot of votes in my poll to find the best hard rock and heavy metal album. At this time of updating this page, it’s ranked equal 11th. What Do You Think About This Live Album? I’ve included it in the poll to find the best live albums featuring Ronnie James Dio. What Are The TWO Best Live Albums Featuring Ronnie James Dio? I think that will also be useful as a guide to the best of the Rainbow live albums on their own to avoid having to do another for Ritchie Blackmore combining Deep Purple and Rainbow. Purple of course have their own poll. Is this one of the best best Hard Rock and Heavy Metal Live Albums? This entry was posted in 1970s Live Albums, Heavy Metal Live Albums and tagged 1970s hard rock, 1976 live albums, Dio Live Albums, Heavy Metal 1976, Rainbow live albums by Paul Simister. Bookmark the permalink.